Please fill out the following form to submit your return request. For a prompt and accurate response, please complete all the details. Please note that you’ll have 30 days to send us back the products you would like to return/exchange should your request is approved. The approval will be deemed expired after 30 days. 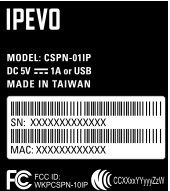 Do note that IPEVO, Inc. sells and ships products only within the continental United States (excluding Alaska, Hawaii, Puerto Rico, APO, FPO and Post Office Box). You can find out the model name and serial number on the package or directly on the product label. Thank you for filling out our online return/ exchange application. A notification e-mail will be sent to you shortly once your request is being processed. Please check your spam filter if you do not receive one.